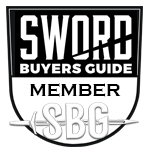 This is a very general question about the use of spring steel for military swords for standard issue swords, if there ever were any. First, I use the term standard issue only to apply to army-wide standardized swords beginning in the 1790s, mainly because that's when the British first adopted any standardized patterns. There were standard issue swords before then but I think the standardization was pretty much limited to regimental level, remembering the way British regiments were created and operated very much on an entrepreneurial model. Naturally there were always substitute-standard models, limited-standard models and just plain non-standard models. But I don't think any of that even enters into the matter. Spring steel is sometimes what some modern-made reproduction swords are made of. As far as I have been able to tell, there were no military swords made of spring steel through the WWII period when swords were last carried, if not use, on the battlefield. Such descriptions that I have found were "tool steel" and "forged steel." Today, they're likely to be stainless steel but "carbon steel" is sometimes available for certain models. But not "spring steel." I was wondering why not. Wikipedia (repository of all knowledge) says it's used for fencing blades, understandably, but for kukris, too, but doubtfully. I do know that my US Army 1902 saber is very springy, although most would say "whippy." It's old and almost certainly not spring steel. I wouldn't call it flimsy but it really is too light for combat but that's just my opinion. I couldn't find any period proof-testing standards for US Army swords, though I expect there were some. British proof testing, I think, consisting of bending the blade a certain degree and seeing if it would return to straight. Perfect for spring steel. I keep reading accounts of poorly made swords in British service bending when in use, which I guess might not be as bad as the blade breaking. But spring steel will break. I know this in two ways. I've seen a fencing foil break and I somehow managed to break one of the springs on my 1965 Land-Rover, although I put another 500 miles on it before bothering to get it fixed. There is also the issue of a spring "taking a set," usually mentioned in pistol magazines. I have, however, in my possession a .45 auto magazine still loaded with seven rounds of ball ammo. It came to me with the original pistol belt, 1st aid pouch and packet and magazine pouch, although only with one magazine. This is the outfit that came down from a WWI veteran, whose sword wound up with another family member. The magazine has the lanyard ring on the bottom. But the point is, the magazine spring works perfectly fine even after being fully loaded for one hundred years. Perhaps they used to make better springs than they do now. So I have my doubts about a spring taking a set. But that's not to say a spring can't be bent out of shape, especially little ones. Apparently a spring really only works in one way and back again, although I imagine there are straight rod springs that are flexible in any direction like a fishing rod but I can't think of one, unless maybe a radio aerial for a car. I gather, though, that "spring steel" is a fairly broad term and covers many variations. The question is, then, would spring steel be good for making a sword. It is a total mystery to me how a piece of steel can be bent and then spring back, even though I see such things everyday. Every steel can be heat treated to be springy. So called "spring steels" contain a little bit of Si what makes them 1 or 2 % better in springyness. The geometry of a certain blade is also very important for its springyness, f.e. a katana blade made of spring steel and heat treated like spring steel will still not be very springy. A thin flexible plain carbon steel blade heat treated the right way will be much more springy. Springs can be bent and still be springy, look at spiral springs. Bending a springy steel too much and too often weakens the steel and it will break nevertheless. Swordsmiths like spring steels because they have less problems with quenching them, less failures. I'd theoretically prefer a blade made of spring steel over a blade of other steel but I know I will never experience the difference. Thanks for the comment. Sorry if my post was rambling but that's how my mind works sometimes. I was thinking chiefly of Western swords, European and American, and not world-wide. I suppose there can be simple answers but there are multiple requirements for a blade and 'springiness' is only one of them and by that, meaning it will return to the straight when flexed. But it can't be as flexible as a foil blade. I recall the habit of flexing a foil blade under your foot in order to give the last four or five inches of the tip a permanent curve so as to hopefully insure that the blade will indeed flex upon scoring rather than breaking or something. So if a foil blades are spring steel, they're really flexible. But my Model 1902 Army Officer's saber is also very flexible--in the horizonal plane. If it flexes in the vertical (in line with the curve in the blade), I can't tell it. I'm not sure if it has too much flex to actually be a half-way decent thrusting sword. It's an old sword, not a Cold Steel version. But the one and only rapier I've handled did not have that much flex, even though the blade was longer. Can stainless steel also be springy enough for a sword blade? A rapier should be stiff for better thrusting, but also it's better if it flexes than if it breaks or bends when hitting a target that it can't thrust through. Afaik stainless steels usually are more brittle, so less flex or bending, more likely to break. Afaik a good smith can make a stainless steel blade that could be used as a real sword, but usually stainless steel is only for wallhangers.